The Precision Door Service system flourishes best through hands-on involvement by its franchise owners. Our franchise owners consist of men and women who come from many walks of life. Most of our successful franchise owners had no previous garage door experience. Through the extensive support and training provided, they are now leaders in the garage door industry. The Precision Door Service corporate headquarters and training center is located in Titusville, Florida. It's there that you and your team members will learn the intricacies of garage door operating systems and how to sell your services to customers. We provide an innovative garage door repair training and certification program to all of our franchise owners and technicians. This program is both hands-on and classroom oriented. 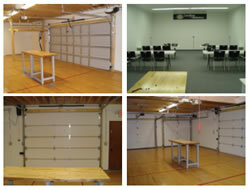 Our state-of-the-art training facility houses every type of garage door and garage door opener. Our experienced and certified instructors will teach you all the skills necessary to succeed in the garage door industry. As a potential franchisee, you decide where you want to work and live. As a nationwide franchise system, many markets are available. For more information, and a personalized market evaluation, dont hesitate - contact us today!